Every year 850,000 people are injured by needles or other sharp medical devices that have not been discarded properly. Sharps is the medical term for any device with a sharp point that can puncture or cut the skin for example, needles, syringes, lancets, auto injectors, infusion sets or connection needles. An estimated 9 million patients in the US have medical conditions such as diabetes, allergies, arthritis, cancer, hepatitis or AIDS and use sharps at home, at work, at school and also while traveling. These patients and their caregivers need to properly discard needles and other sharp devices to protect others from injuries and infections spreading such as Hepatitis B, Hepatitis C and HIV. 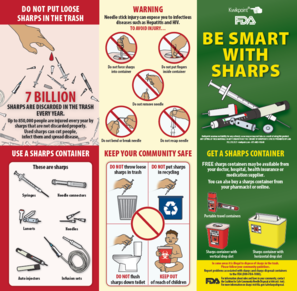 The FDA estimates that 7 billion sharps are loosely discarded yearly in regular trash instead of being safely discarded in a dedicated container. 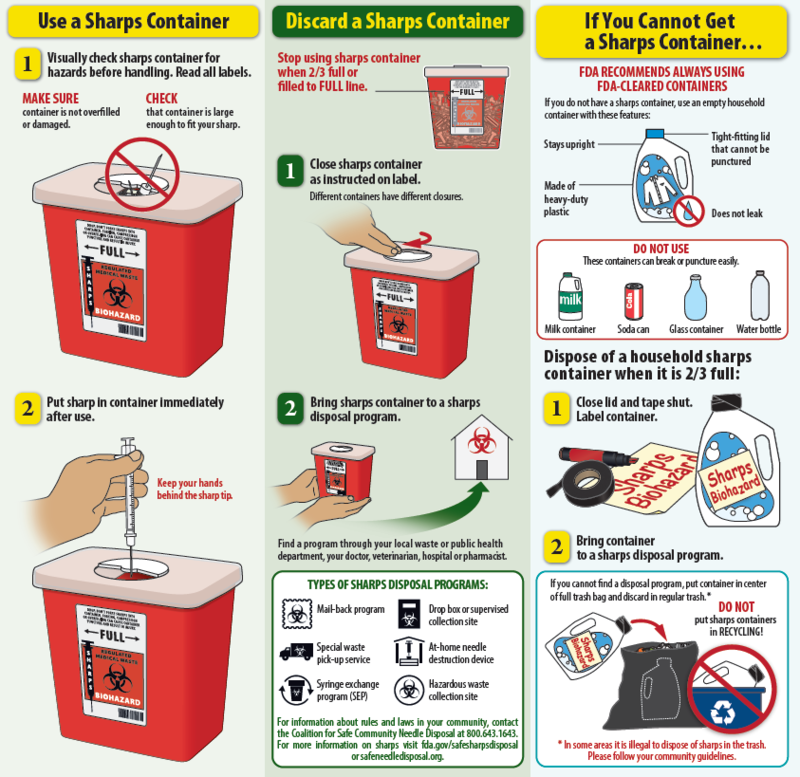 Patients using sharps should never discard their sharps in a regular trash can but in a dedicated sharp container with a vertical drop slot. These containers are often available for free at doctors offices, hospitals health insurance offices or medical suppliers. They can also be bought online or at any pharmacy. The container should never be more than 2/3 full to avoid injury. Never force sharps into the container. 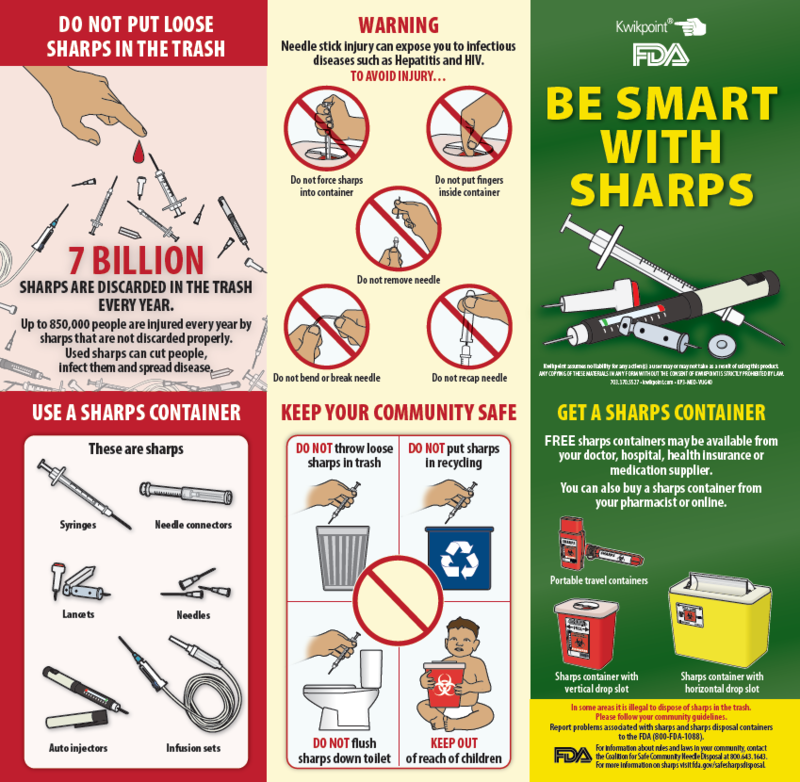 Sharps containers should be brought to sharps disposal program site. 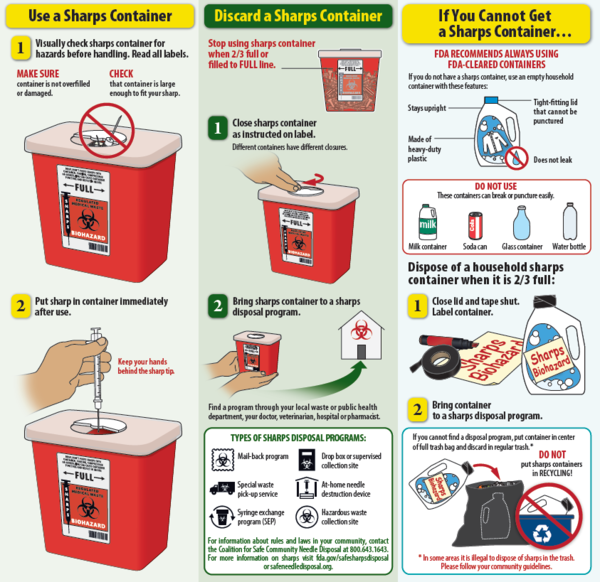 Patients who are travelling or do not have immediate access to a regular sharp container should use an empty household container made of heavy-duty plastic that can be put in the center of a full trash bag if they don’t have access to a sharp disposal program. Patients who loosely discard their needles in a trash bag put sewage workers, janitors, housekeepers, household members or children at risk of an injury that can lead to a dangerous infection. Do not put sharps in recycling, do not flush them in the toilet and keep out of reach of children! If you have been injured by a needle or a sharp used by someone else, wash the area with water and soap or antiseptic and call your doctor immediately.